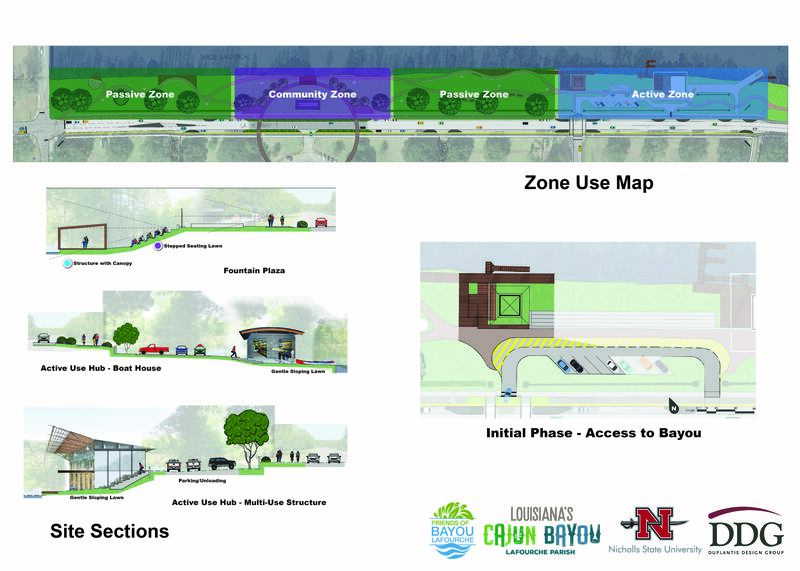 The Board of Directors for Friends of Bayou Lafourche, Inc. (FOBL) is pleased to publicly release the Nicholls State University Bayou-Side Comprehensive Master Plan. A Cooperative Endeavor Agreement was signed with Nicholls State University in December of 2017 to “collaborate with the University to establish a program for the (bayou-side) property with an emphasis on faculty, staff, student, and public recreation”. FOBL acquired funding from Louisiana’s Cajun Bayou in order to procure a landscape architecture team with Duplantis Design Group to design a phased master plan. Four meetings were held with Nicholls administration, faculty, staff, student leaders, and community key stakeholders to develop the comprehensive plan. Representatives of the City of Thibodaux, Lafourche Parish Government, Bayou Lafourche Fresh Water District, Louisiana’s Cajun Bayou, Thibodaux Regional Medical Center, Bayou Rowing Association, and others participated in the planning meetings. The plan includes but is not limited to boardwalks, floating dock, outdoor classroom, amphitheater, sculpture pads, walking trails, off-street parking, pavilion, boathouse, special-use boat launch, covered seating, multi-use building, and enhancements to Hwy 1. With the cooperation of the university, FOBL intends to seek construction funding in order to make the plan a reality through phased implementation. 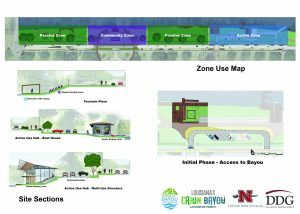 Funding for Phase 1, which will provide access to the bayou, has already been requested through a federal recreation program.